These images offer a dramatic look at C153, a galaxy being ripped apart as it races at 4.5 million miles per hour through a distant cluster of galaxies. The infalling galaxy's gas is being stripped by the pressure of 20-million-degree Celsius gas that permeates the cluster. At left is a composite image made by combining the four images at right, taken in X-ray, radio, and visible wavelengths as well as the visible, green light emitted by oxygen ions. 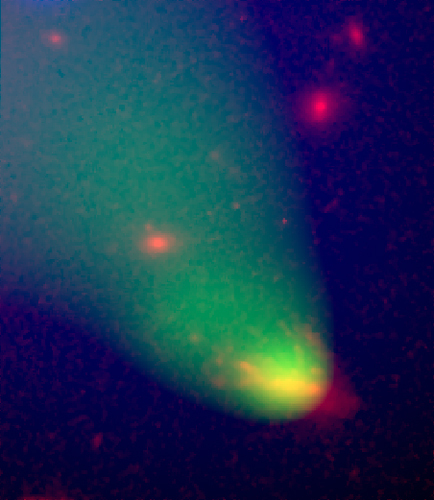 Long comet-like streamers of gas can be seen flowing from the galaxy as it travels through the cluster called Abell 2125. The images span about one million light years. The Chandra X-ray image shows a tail of hot gas extending from C153. The temperature of the gas tail is about 10 million degrees Celsius, cooler than the surrounding cluster gas. This temperature difference is further evidence that gas is being stripped from the galaxy. The image taken in visible light from glowing oxygen ions shows a similar tail forming as gas with a temperature of about 10,000 degrees Celsius is pulled from the galaxy. Hubble's broad band visible-light image reveals intricate detail in the distribution of stars and dust within C153. The galaxy exhibits evidence of a large-scale disturbance that has left its star-forming regions concentrated to one side of its disk and beyond. Dust features are twisted into chaotic patterns, obscuring any spiral pattern the galaxy once had. Radio observations depict high-energy particles as they spiral through the galaxy's magnetic field, with some escaping in a perpendicular direction to the galaxy's disk. The high-energy particles probably came from a supermassive black hole. Scale Image is 34.0 arcsec across. Coordinates (J2000) RA 15h 41m 09.76s | Dec +66° 15´ 45.00"